Sorry, Mets fans. This one isn't about you, so if you ended up here searching for coverage of the Mets-Dodgers series, you're bound to be disappointed. (By the way, if it wasn't for the Dodgers leaving New York, the Mets probably wouldn't even exist, since the reason they left was because Robert Moses (a.k.a. The Power Broker) wanted to move the team to a brand new stadium in Queens and the owner of the Dodgers didn't want to go to Queens--because really, who does? So, the Dodgers moved to LA and the Mets were born. A side note--in their first season, the Mets lost every single game.) As I mentioned in yesterday's post, this week is all about the 1990's and since this week marked the start of the 2015 post season, I figured I'd go old school with 19 year old baseball. For those of you that can't subtract, 19 years ago was 1996 and in 1996 one team ruled Major League Baseball: The New York Yankees. 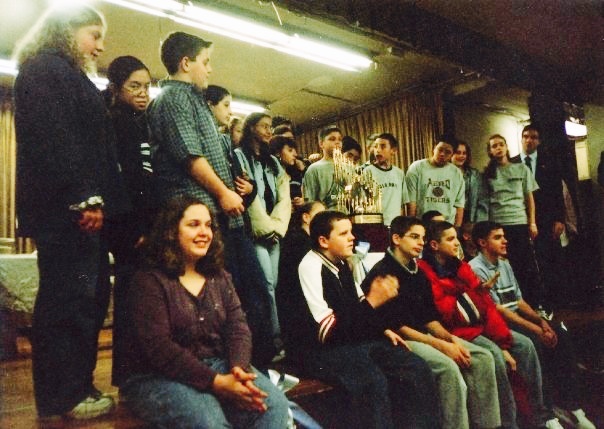 A month before the World Series began, I started 5th grade at a little known school in Queens, but by the end of October, everyone in New York City had heard of us. Yep. I went to Nativity B.V.M. in Ozone Park a.k.a. The Yankees School. For everyone outside of the New York City Tri-State area, the reason we were a big deal (at least to every local news affiliate) was because our principal just happened to be Joe Torre's sister, Sister Marguerite Torre. From the moment, the Yanks made it into the post season, Sister had the entire school praying for a Yankees win, and I have to say the first couple games against the Braves did not make it look likely that they'd win. After losing the first two games of the series, however, they came back to win the next four and bring the trophy back to New York City for the first time since the Mets did it 10 years earlier (defeating the Boston Red Sox and firmly keeping The Curse of the Bambino in place for almost 20 more years). Originally, I was searching for a video featuring my school (you would think one of the parents would have saved their VHS tapes, converted them to DVD, and figured out how to upload them to youtube), but I couldn't find anything. Instead, I found Game 6 of the 1996 World Series. Yes, the entire game. If you have 3 hours to kill, take a gander at the below video. Also, Happy Birthday to my brother--I didn't even realize I'd scheduled this to post today, so sorry, but it isn't like the Mets were any good in the 1990's (no matter how many times they blasted Johnny B. Goode at their home games). I forgotten that your class had your picture taken with the world series trophy.